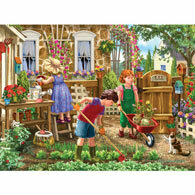 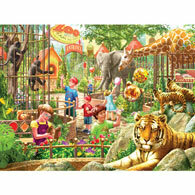 Back Yard Fun is a 500 piece jigsaw puzzle designed by artist Liz Goodrick-Dillon. 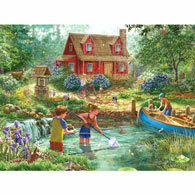 Two boys are climbing up the tree house and other children are catching butterflies on a bright summer day. 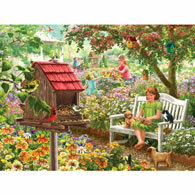 The backyard of this house is covered with summer flowers while birds perch on the birdbath in a colorful scene.